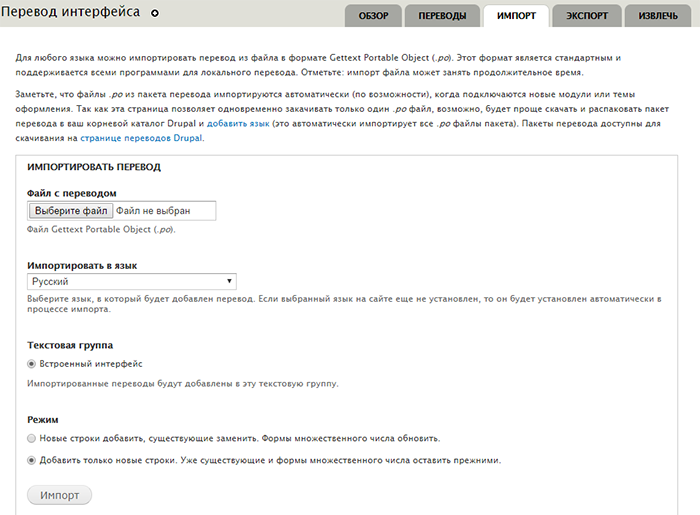 Using this manual, you can set up payment acceptance for your website at Drupal via one of the Yandex services. Yandex.Checkout: allows accepting payments to settlement account, onboarding via a contract. Suitable for legal entities and private entrepreneurs. Yandex.Money: accept payments to Yandex.Money wallet. No contract required, suitable for individual sellers. Yandex.Billing: accept payments to company's account, no contract required. Suitable for legal entities and private entrepreneurs. 1. Download the archive (.ZIP, 87 KB). 2. Copy the contents of the archive to the /sites/all/modules folder on your server. 3. Select "Modules" in the dashboard, then find "Yandex.Money 2.0" in the opened list. 4. 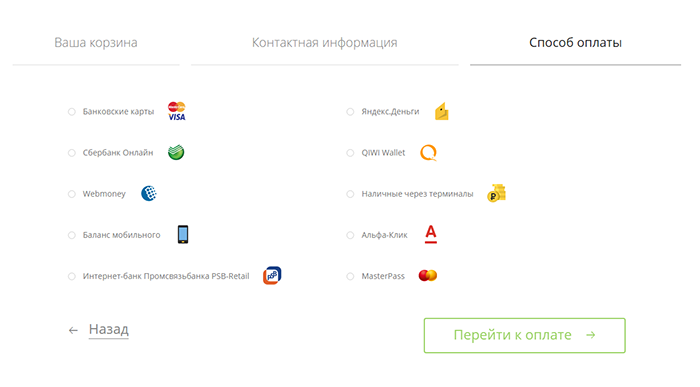 In the "Yandex.Money 2.0" section, check the boxes for Yandex.MoneyCore, Yandex Ubercart, and Yandex Commerce. 5. Click "Save the settings" and wait for the "Settings saved" message. That's it: the module has been installed and activated. 1. Select Configuration in the website's dashboard. Find the "Region and language" section and click "Translate interface". Внимание. If there's no "Translate interface", click "Modules", find the "Locale" module in the opened list, and check its box. 2. View the "Import" tab at the "Translate interface" page and upload the .PO file from the archive containing the module. 3. 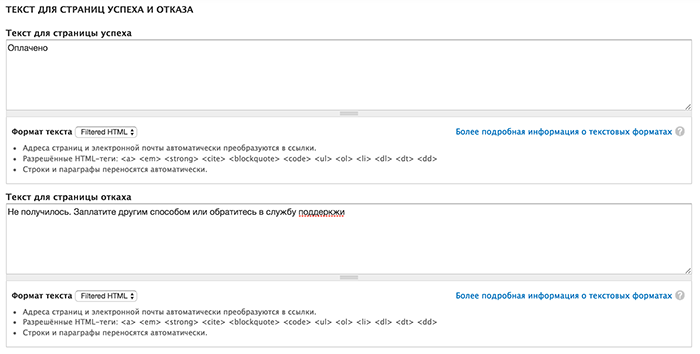 Click "Import", and the module's interface will be translated into Russian. First of all, you need to sign up for Yandex.Checkout and get your shopId and Secret key. Once you get both parameters, you can proceed with configuring the module depending on your version of Drupal. 1. Select Configuration — Yandex.Money 2.0 module settings in the website's dashboard. 2. 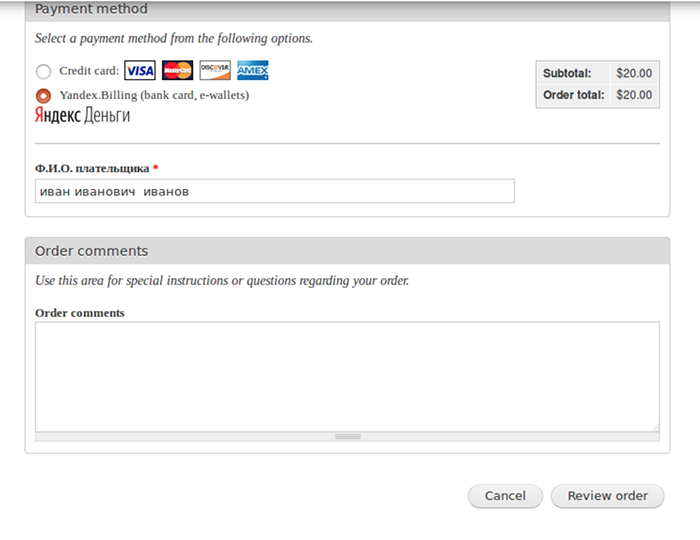 Select Yandex.Checkout on the left and check the Enable payment acceptance via Yandex.Checkout box. 3. Fill out the shopId and Secret key fields: you can get both parameters in your Yandex.Checkout Merchant Profile. then indicate the VAT rate to be specified in the receipt. 7. If you want to use deferred payments (preauthorization), enable it here. 8. "Success page text" will be shown to the customer after they pay for their order. Enter "Paid" or other similar message. 9. "Error page text" will be shown to the customer if something goes wrong: for example, if they don't have enough money on their card. Explain that there was an error and help them solve it (for example, as in the screenshot below). 10. Click "Save the settings". That's it: you can test payment acceptance now. Navigate to Reports — Yandex.Money 2.0 transactions in the dashboard to open the list orders. If the order has the Waiting for capture status (waiting_for_capture), you can view, edit, capture, or cancel it. Find the required order. In the Actions column, click Capture to capture the payment or Cancel to cancel it. Results are displayed in a pop-up window immediately after you click the button. You can edit the contents of the order before capturing the payment: remove items or change their quantity. Select the required order and click Edit in the Actions column to open the order card contacting the list of items. Quantity of items in the order can be changed in the Quantity column. To remove an item, check its box in the Remove column and click Add line item, then save the changes. If you partially capture the payment, the remaining part is returned to the buyer. Using this module, you can accept payments from bank cards and Yandex.Money wallets. The settlements will be made to your Yandex.Money wallet. 1. Select Configuration — System — Yandex.Money 2.0 module settings in the website's dashboard. 2. 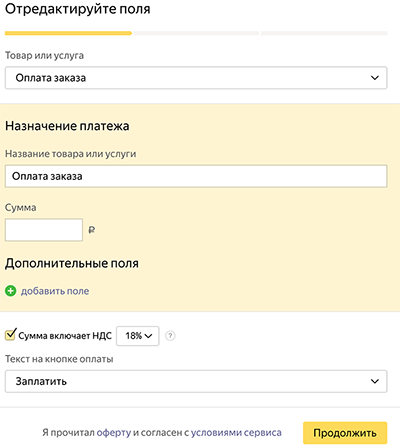 Select Yandex.Money on the left, check the Enable payment acceptance to the Yandex.Money wallet box and enter the number of the wallet that you'd like to accept payments to. 3. 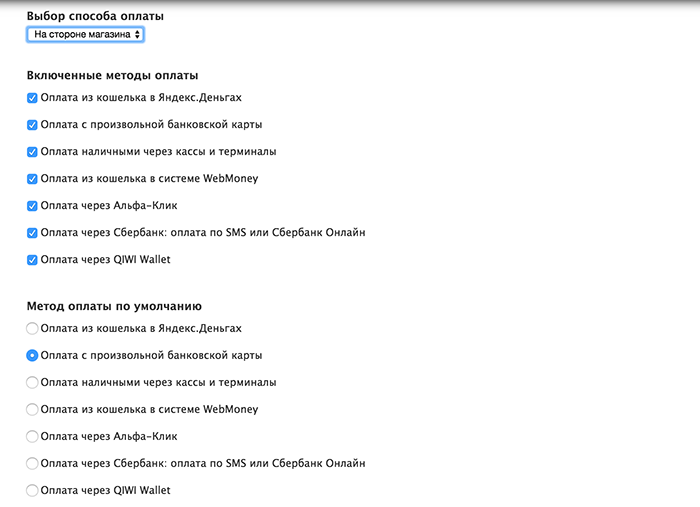 Copy the "Link for HTTP notifications" to the Yandex.Money wallet's notification settings. Check the "Send notifications" box and click "Save" at the bottom of the page (in the notification settings at the Yandex.Money website) . Return to the module configuration. 4. Indicate your store's name in the "Payment commentary" field. 5. "Success page text" will be shown to the customer after they pay for their order. Enter "Paid" or other similar message. 6. "Error page text" will be shown to the customer if something goes wrong: for example, if they don't have enough money on their card. Explain that there was an error and help them solve it (for example, as in the screenshot below). 7. Click "Save the settings". That's it: you can test payment acceptance now. Get the payment form settings at the Yandex.Billing website. Indicate these settings in the website's dashboard. Pay the fee for using the form. 1. 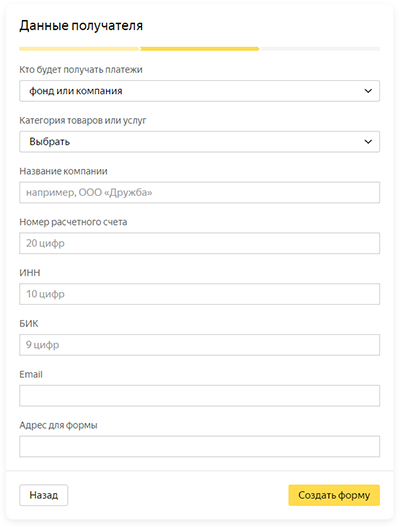 Fill out the form template at the Yandex.Billing website: indicate "Payment for order" in the Name of product or service field. You don't need to fill out the Amount field, add other products, or additional fields, as this information is already included in your CMS. 2. Click Next and fill out the company questionnaire on the next page. URL of the website where you're going to accept payments via Yandex.Billing. 4. If everything's in order, you will receive an email containing the form's parameters and banking details for paying the fee. 2. View the Yandex.Billing tab and check the Enable payment acceptance via Yandex.Billing box. 3. 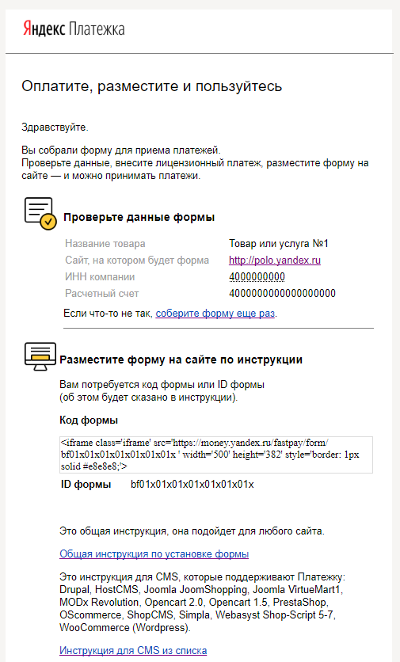 Copy the Form ID parameter from the email you received from Yandex.Billing after setting up the form to the Yandex.Billing's identifier field. 4. 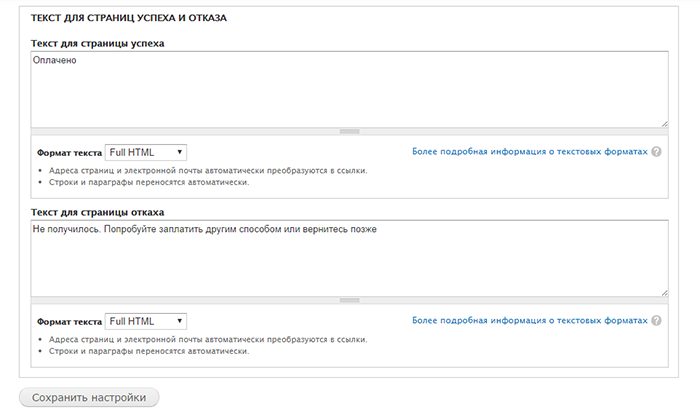 In the Payment purpose field, indicate everything that will help distinguish the payment made via Yandex.Billing. This text will be included in the payment order. 5. Save the settings. All you need to do now is pay for the form and start accepting payments. 1. Open the email containing the form's code and the banking details for paying a fee. 2. Pay 3,000 rubles using the banking details of the settlement account that you will use for accepting payments (otherwise, the fee will not be considered as paid). 3. As soon as we receive the funds, we will activate the form and send you an email. The duration depends on your bank, but it shouldn't take more than 3 days. 4. Make a test payment for a small amount: check that the form works properly, and the money can reach your account. That's it, you can accept payments now. Внимание. One paid fee covers all the forms that you select for your company (we check by INN (TIN) indicated during the creation of the form). Limitations on quantity and amount of payments also apply to all forms at the same time.